Martin Cupak moved to Perth from Europe and joined the DFN team in January 2013. Since completion of his Masters degree in Computer Science at the Czech Technical University in Prague he has worked as a software developer and later as a head of several embedded software projects, particularly in the area of of ground-based astronomical instruments and space projects, including flight software for satellites and several on-board instruments. Martin has been involved in several fireball networks, including the Central European Fireball Network and the Australian Desert Fireball Network (DFN), since the beginning of the automated observation. He developed the control software for the film-based cameras and through the years (since 1998) he has been participating in the fireball networks’ design, development, installation and operation. Martin’s role within the DFN team is to develop software for new digital camera systems, automate data collection and processing and also to keep the DFN cameras networked via the Internet. He also participates in operation of the existing film-based cameras. He enjoys this work because it is an amazing project and also because it is a balanced combination of office/laboratory work and field trips to outback, far away from the hectic civilisation. 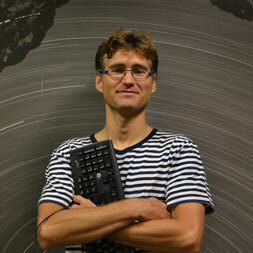 Martin holds an essential piece of programming equipment – his keyboard.